Any tile cleaner in Whyalla or carpet cleaner in Adelaide can clean anything… right! But….Can every carpet cleaning service your needs expertly, professionally and with industry best practice? And do they produce carpet cleaning, upholstery cleaning and tile cleaning results like this? Here at Adelaide Fibredry we do things a little differently for our cleaning customers in Whyalla, Port Pirie, Port Augusta, Port Lincoln and Adelaide – you see, our focus is the best trained, most knowledgeable team using the latest in equipment and sustainable cleaning technology to achieve the best possible results across a wide range of surfaces including carpet cleaning, upholstery cleaning, tile cleaning, mattress cleaning and more! Makes sense, right?! Top 5 Reasons Why We’re Better! 18 years carpet cleaning service experience from Whyalla to Adelaide (including Port Lincoln, Port Augusta & Port Pirie) – from carpet cleaning to tile cleaning, upholstery and mattresses! Ongoing training – our team are up to the minute! We’re here to help clean your carpets, grout, tiles and more and get them sparkling like new. We’re absolutely committed to having you delighted with our work as we want your business, and would love having you tell your friends just how great we are! We service Whyalla to Adelaide and beyond for carpet cleaning and more. 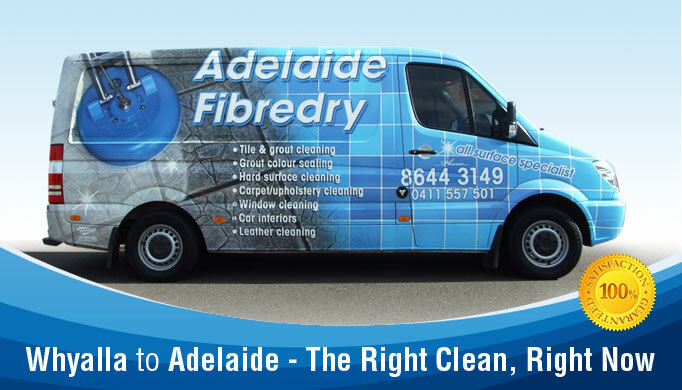 Adelaide Fibredry provide fantastic results time after time and most importantly at competitive rates. The results he was able to achieve were simply fantastic. Copyright © 2019 Adelaide Fibredry. All Rights Reserved.